Spacious 2 bedrooms, 2 baths located on the beach. Close to Everything! To reach our casa you will have to walk down 32-44 stairs. It is located in a large private foyer shared with one other unit. Upon entering the casa, the guest bedroom is on the right, with the main living space in front of you. The guest bedroom has a queen size bed, futon, and a private bathroom. The main living space, including the kitchen and bar, all have views of Zihuatanejo Bay, Playa La Madera, Playa Municipal, and the Pier. There is good WiFi throughout the condo. The master bedroom has a king size bed, 32" flat screen HD smart cable TV, and a private bathroom. Both bathrooms have large walk-in showers. Both bedrooms have sliding doors that offer a view of Zihuatanejo Bay. The main living space is open air allowing for the ocean breeze and sounds to flow through the condo. In the living space there are plenty of seating options, from the comfortable large couch, to the bar stools in the kitchen, the egg chair, loungers, or your hammock! Each bedroom does include air conditioning units. The kitchen is equipped with a fridge/freezer, microwave, toaster, blender, coffee maker, tea kettle, as well as dishes and silverware. We love the location because it's walking distance to Playa La Ropa, Playa La Madera, and Centro (lots of shopping and restaurants). There is always something going on and something to do. Plus massages on the beach for 200 pesos, beers for 25 pesos, and Happy Hour margaritas for 35 pesos. Life is great in Zihua! Ali: From the Seattle area. Went to Washington State. Online English Teacher. Matt: From Tennessee. Die Hard Volunteers Fan. Moved to Seattle in 2004. We travel as much as possible, and found the Mexican people, especially in Zihuatanejo, to be warm and friendly. We spend half the year in Zihua. We have been visiting Zihuatanejo since 2012. We wanted a location that was on the beach, had a nice pool and amenities, and was walking distance to bars, restaurants, shopping, and activities. This was the perfect location, so when this property began construction in 2016 we were one of the first people to jump on board. We are here in Zihua during the prime season to answer any questions you have about the area. 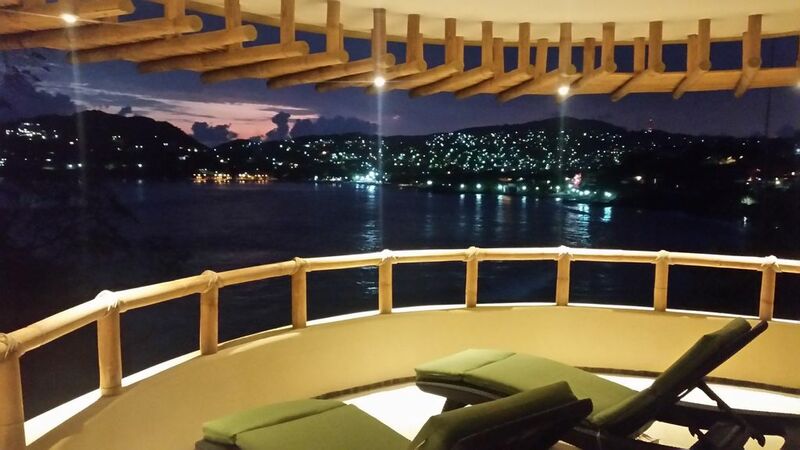 The view of Zihuatanejo Bay is unbelievable. Whether it's in the morning watching the small fishing boats come in as joggers run along the beach and malecon, or in the evenings when the homes that surround the bay light up as we take a swim in the pool, we never get tired of the view. We are located 0.5mi (0.75km) from downtown Centro, with a view of the main plaza from our casa. You can paddleboard into the Pacific Ocean if you wanted. There is nothing in front of us, but beach! The beach is easy to walk on sand. You can walk over 100 feet into the water before it reaches your knees. We are located in The Bay of Zihuatanejo, that opens up into the Pacific Ocean. We have one parking spot available, if needed. We do advise against renting a car. It's easy to walk, taxi, boat, or bus just about anywhere within 20 miles. Free WiFi throughout the casa. The dining area is a kitchen island bar top with 4 padded stools. We have the channel list in the casa. 25-30 of the channels are in English. It's a smart TV so you can watch Netflix or YouTube on it as well. Small library of 30 or so books. Take a book, leave a book. The entire living room area is a balcony overlooking the Bay. 80 foot long Infinity Pool is located 2 flights above our unit. Housekeeper will clean once mid-week for all 7 day stays. Additional days available for $25 per day. Our visit to Mathew’s property could not have been better. The building staff (Hugo) was a big help and always available. A bonus is that Mathew also has a local caretaker (Lionel) was available to us 24/7 and introduced us around town and made sure we knew where all the locals shop and eat. We loved our stay and will definitely return. My husband & I stayed at Casa di Ali for three weeks during January/February 2019 and had an amazing trip. The condo was beautiful and perfect for us. The view is spectacular both day and night. Matt & Ali were so accommodating and made our stay effortless. The pool is beautiful and the staff at Kau Kan extremely helpful. The kitchen is very well stocked but we didn't use it much only because the eats and drinks in Zihua are fabulous. We loved to make the easy walk into town for dinner and take a quick taxi ride back to soak in the night view. Another great trip to Zihua....we will be back!! Thank you so much for staying at our place and visiting Zihua! Modern, well appointed, roomy two-bedroom with stunning view. Great location, walk to everything. We stayed here for a month, 10 days of which we shared with another couple. Definitely a top-notch condo with fantastic view and in a great location! We could walk downstairs to Madera beach for a swim in two minutes, and be at two other beaches or downtown in 15 minutes. The pool, seldom used by others it seems, is just above and features a great lounge area and that same stunning view. The condo was very clean, and was kept so by maids during our stay, and has everything you need. Matt and Ali have a great manager when they're away - friendly, knowledgeable, and willing to show you around if you so choose. When they arrived, Matt and Ali made themselves available to help or answer questions as needed, but never imposed themselves. We definitely recommend this roomy, comfortable condo. It was quite hot when we were there but the excellent fans and the bedroom air conditioners made us perfectly at ease. We don't usually give five stars , but this place has it all! We'll be back. This 2 bedroom, 2 bath condo is in a new building. It has such a spacious feel to it with high ceilings and an open living plan. Bedrooms are very private and both have doors that pull closed and A/C although we never used it or closed the doors. You feel so close to the outside with the waves rolling in all night, but never too loud. Matt & Ali, your hosts, are very friendly and hard working. They have thought of everything! Small but nicely equipped kitchen which we used only for breakfast as Calle Adelita (5 minute walk) has so many great restaurants as does the rest of Zihua. We usually stay on Playa La Ropa and loved staying on Playa Madera this time. This condo is even more beautiful and perfect than the photos let on. The infinity pool is REALLY nice and water temperature perfect. Honestly this was one of the best vacation getaways we have ever had. We have traveled to Zihua many times and for many years and this accommodation stands out. Go! This is a beautiful property, (brand new and still under construction on the second building) we enjoyed out stay at this open air, quiet and clean property. The owners are very considerate and have pride in this vacation property, they are available for any questions or concerns and respond quickly. There is every and any thing you might need to stay here with out worries. There is nothing like a sunset or sunrise at this casa, close to everything you might want to enjoy, we had some great adventures! Even better than the pictures. Clean, spacious, well appointed. Very responsive owners. Will definitely book again.